More than ten years after Johann Olav Koss' triple gold medal performances at the 1994 Lillehammer Games, the Norwegian is as well-known in the Olympic arena today as he was then. Speed skater Koss has remained close to the true ideals of the Olympic movement by devoting considerable time and energy to various worthy causes. One of them is Olympic Aid, set up by Koss at Lillehammer to help refugee children in trouble-spots around the world. The Norwegian star, fresh from his victories in the 1500m, 5000m and 10,000m races, signalled his intent by donating 30,000 dollars to the new organization and called on fellow Norwegians to donate a small sum each time one of their athletes won a medal. Koss also auctioned the skates he was wearing during his treble, raising a further 80,000 dollars for Olympic Aid. He then kept his promise to return to the war-striken African state of Eritrea with 12 tons of sporting equipment on behalf of the people of Norway. After retiring from competition in 1994, following his third world all-around title Koss began studying medicine while continuing to play an active role in the humanitarian and political areas of world sport. An ambassador to the Olympic Aid movement since 1994, he is also a special representative for UNICEF, as well as president of the Norwegian forum against doping and director of an Australian institute for winter sports. In 1997, he founded his own humanitarian group, SHG (Sport Humanitarian Group) based in New York, which worked to bring about the reconstruction of the Olympic speed skating oval at Sarajevo, destroyed during the civil war in Bosnia. 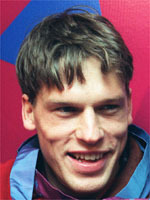 Elected to the International Olympic Committee's athletes commission during the 1998 Nagano Games, Koss was inducted as a full member of the IOC in December, 1999. Also a member of the Olympic movement's medical commission since 2000 the Norwegian has taken an extremely tough stance against doping in sport and in particular authorised food supplements currently used by many athletes in many countries. He is widely tipped to reach the higher echelons of the Olympic Movement for whom he manages an association known as "The Right to Play", a humanitarian group helping children in poverty stricken countries with the support of coaching and star athletes. He married in 1999 and now lives in Ontario, Canada, committed to his cause like few others.